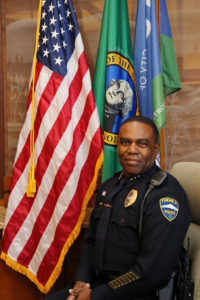 As the Chief of Police for the City of Tukwila, I am delighted to be your public servant, leading a group of the most dedicated law enforcement professionals I have had the privilege to work and serve with during my law enforcement career. The department’s focus over the next several years is to genuinely engage on a level that will build trust and legitimacy between our police department and the citizens we serve. Building trust is foundational and taking the time to get to know our citizens is how we want to move forward, working together to create a safer place to live, work and play. Thank you for supporting our police department and for allowing me to lead this organization as we work together to create a future of a safer Tukwila. Thank you for allowing me to serve!